Speed Poker - Lightning Fast Poker! Speed Poker is the lightning-fast poker game now available at Titan Poker. You can choose between Texas Hold’em and Omaha Speed cash tables or have a go at one of the exciting Speed Tournaments. Speed Poker will keep you in the action at all times. Playing Speed Poker’s large player pools with instant fold capability enables you to experience the thrilling pace of speed poker without the need to wait around for your opponents to act. Check out our Speed Poker Infographic and learn how to win in Speed Poker! How does Speed Poker work? Joining a table enters you into a large player pool. You’ll face a different table of opponents every hand you play. You can fold at any moment, even when it’s not your turn to act. When you fold, you’ll immediately move to a new table to play a new hand. Have questions? Check out our Speed Poker FAQs. Download our free poker software now and experience the fast paced action! Click here for Speed Poker FAQ’s. Speed Poker is the lightning-fast poker game now available at Titan Poker on Texas Hold’em and Omaha tables. Here are simple instructions how to play Speed Poker. If you want to be a winning Speed Poker player, click to our Speed Poker tips below. Playing Speed Poker, you can build up your bankroll faster than ever before, but this requires implementing strategy geared for the Speed Poker tables. Every online poker player can quickly learn how to play Speed Poker, but winning at the lightning fast tables is a bit more demanding. We’ve prepared for you a list of important poker tips that will inform you how to win at Speed Poker. If you follow these tips and act accordingly, you will come out as a winning Speed Poker player. Speed Fold = In Speed Poker, tight is right. You can immediately fold your bad cards and get whisked away to a new table to face a new set of opponents. Don’t even take the time to think about playing bad cards. Speed fold until you get something to play. Don’t Speed Fold = As most of your opponents will be playing tight, insta-folding with all but the best cards, if you don’t select that option your opponents will assume you have an unbeatable hand. Your average cards just increased in value. Call it a bluff, or just an adjustment to the fast-paced nature of the game. We realize that this advice is exactly the opposite from our first tip, but you’ll just have to make the decision how to play as you go along. Bet from the Big Blind = In the Big Blind position you don’t have the Speed Fold option. But when a player on the button tries to steal the blinds, you can assume that he’s got a low value hand. You’ll find this out if you raise. Raise to steal = Here’s the same advice from the other side. If you think you can get past the Small and Big Blinds, make a raise. Those players are likely to assume you have a killer hand and fold. Don’t get involved with marginal hands = If the Speed Poker table is full and you’re not sure about your hand, select the Speed Fold option. If there are empty seats at the table, you just might want to change your strategy. Allow aggressive players to bet into you when you have monster hands = While it’s impossible to take notes on your opponents due to the speed of Speed Poker, when you come up against an apparently aggressive player, make sure to display patience to draw him into your monster hand. When you win, you want to win big. Choose your hands wisely = Your opponents will make mistakes, and those mistakes will come at a faster pace than in regular poker. Play your own cards carefully and with patience. Wild moves will result in erratic results. Play tables you can afford = As with any type of poker, you should only join the cash tables that are suitable to your bankroll. The main difference here is the speed of the game. If you’re on a losing streak, your chips (and your bankroll) could be depleted in no time at all. It’s best to try out Speed Poker at the lowest stakes and only move up when you’re comfortable with the pace of the game. 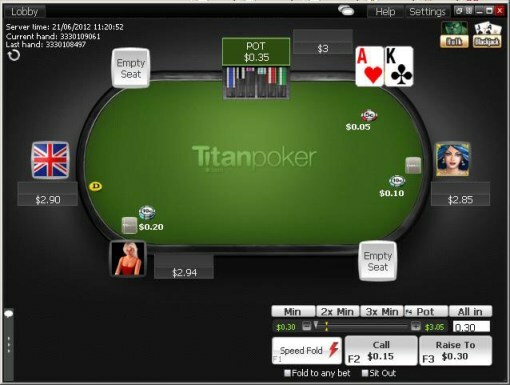 Speed Poker is a new poker format available at Titan Poker. When you play Speed Poker, you’ll enter a large player pool and face a different table of opponents every hand you play. As soon as you fold your hand, you’ll immediately be moved to another table for your next hand. What does the "Speed Fold" button do? The "Speed Fold" button – located at the bottom of the Speed Poker tables – moves you to another table for your next hand right away, even if the action hasn’t reached you yet. Players at your previous table will only be able to see you fold when it’s your turn to act. 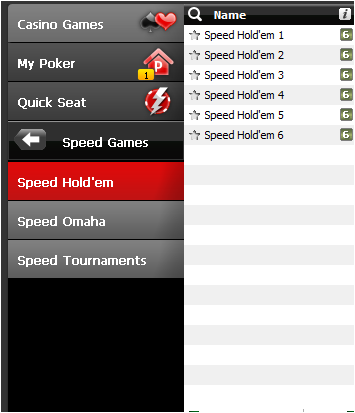 You can use the "Speed Fold" button at any point in a hand as long as you are facing a bet. Once you click on the Speed Fold button, the action cannot be reversed. How does seating position work in a Speed Poker game? When you join a Speed Poker game, most of the time you’ll be seated in the big blind position. When you move to a new table, the big blind is assigned to a player who has gone the longest without posting it. All other seating positions are random from hand to hand. Can I open more than one table of the same stake? Yes, you can enter a table up to 4 times for each stake, meaning that you can play at 4 tables simultaneously per stake level. Can I observe a Speed Poker game? Every time a player in a Speed Poker game folds or finishes a hand, he is moved to a new table. Therefore, opponents are not constantly seated at the same table for you to observe them. The best way to experience Speed Poker is to try it out! Is there a difference in Titan Point generation at Speed Poker tables? No, Titan Points are awarded in the same manner as at a standard ring game. For example: If you contributed $1 to the rake in a real-money Speed Poker game you will be awarded with 20 Titan Points. See the Titan Rewards page for a detailed explanation of earning Titan Points.